Often medieval manuscripts, especially those of theological or historical treatises, contain more than one work. This 12th-century manuscript has copies of works by the early medieval authors, Isidore of Seville and Alcuin, on the subjects of goodness and wisdom, along with verses on the eucharist, faith and the Fall. Such a collection would have been read by the medieval monks of Haughmond Abbey as part of their daily program of prayer, contemplation and study of scripture. 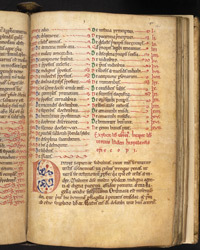 A page from Isidore of Seville's 'On the Highest Good,' shows a 'table of contents' or list of chapters for Section 3 and, in larger red letters, the note that the new section begins. Throughout the page, colour is used to clarify the different elements of text. In the chapter headings, the scribe carefully used alternating colours for the first letters to help the reader keep his place. Lower on the page, a reader has made a correction: correcting texts could also form part of the monk's daily study. Section 3 concerns divine wisdom, relating to the following book on wisdom by Alcuin. Isidore (560-636), bishop of Seville, wrote several important treatises, such as 'Etymologies', many of them influencing early Anglo-Saxon and Irish writers, such as Bede.